Shame on Toyota! Frame has severe corrosion rotted through. I heard a clanging noise under the back drivers side that got progressively worse. I brought it to my local mechanic. 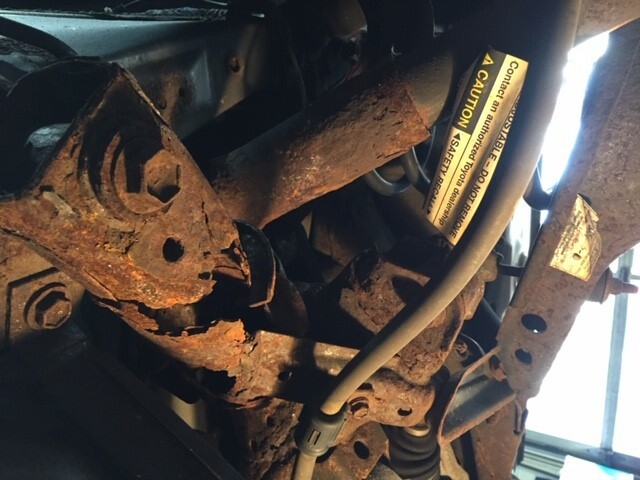 He has deemed it unsafe to drive with sever rotting through of the frame. My research online indicates this is similar to Brian Warner et al. v. Toyota Motor Sales, U.S.A., Inc., Class Action Settlement on the Tacoma, Tundra and Sequoia and recent investigation into the 4Runner by National Highway Traffic Safety Administration (NHTSA). They obviously have a problem with what was being installed across multiple models and are not being proactive to resolve it.